FCFA is training African scientists in new skills and methodologies to study the African climate. Bamba Adama participated in a week-long workshop on climate modelling at the University of Leeds, organised by the AMMA-2050 project in December 2016. Bamba Adama has a doctorate in climate science and now teaches at Côte d’Ivoire’s largest university – but he’s still eager to learn more about climate change at every opportunity. 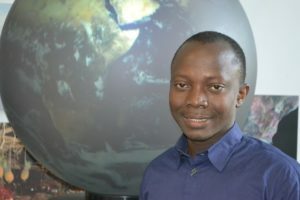 Dr Adama travelled to Leeds, UK as part of a group of early career African scientists sponsored by the Future Climate for Africa’s Africa Monsoon Multidisciplinary Analysis (AMMA-2050) team in December 2016, to learn Python: a computer language that is useful across many climate modelling platforms. Dr Adama also has immediate plans for applying his new skill to research in the AMMA-2050 project, which is seeking to better understand the dynamics of the west African monsoon and project its trends to the year 2050. “In the project, I want to look at the impact of land-surface change on climate variables in west Africa,” explained Dr Adama. “In west Africa right now, we are facing decreases in forest cover. Politicians, business people and resource managers making decisions sometimes lack knowledge of the climate sciences, added Dr Adama. His aim is to better understand the linkages between land surface changes and the west African climate and to present that information in crystal-clear ways that decision-makers can understand. From decisions at the farm level to high level policy decisions, being armed with robust science will enable his team to provide “constructive suggestions,” he said. His plans will start with publishing his future findings in academic journals, followed by meetings with decision-makers and campaigns on social media to spread the word.